Yellow leaves on gardenias are a problem most gardenia owners have at some point. It occurs on both indoor and outdoor plants. Gardenias are extremely fragile. Cold temperatures, poor drainage, nutrients, fertilizers or pests could all be the reason for yellow leaves on gardenias. Check under the yellowing leaves of your plant to see if you have any pests. Check the soil and stems of the plant when watering to see if any pests show up. If you see any pests on the ground, leaves or stems, apply a pesticide. Neem oil is an excellent organic pesticide for most garden pests. Neem oil is a vegetable oil from the fruit and seed of neem (Azadirachta indica), an evergreen tree. It is used for organic farming and medicine. It is not harmful to birds, mammals or butterflies. It has a strong odor of peanut oil and garlic. Cold temperatures can also cause yellowing of the leaves. Gardenias need at least eight hours of sunlight a day. If they are in pots, move them to an area where they get more sunlight. Placing the gardenia in a heated area can also be helpful. A sun lamp designed for plants is also an excellent source of heat. Once you determine that water or pests are not the issue, check your soil. 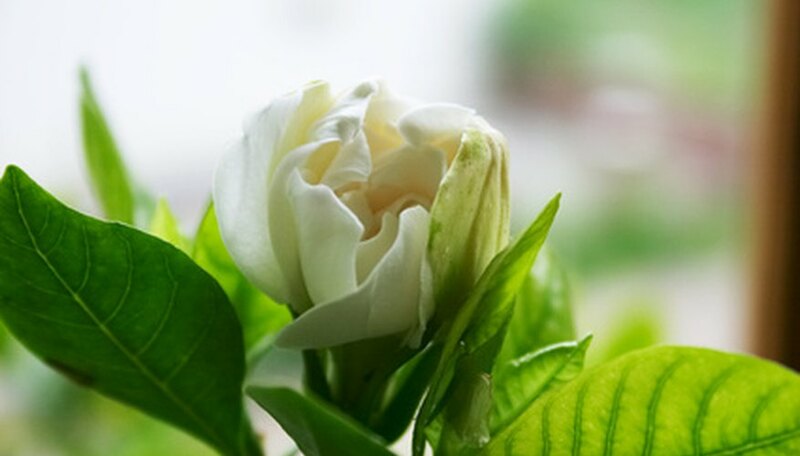 By adding certain nutrients, the gardenia could be much healthier and easier to care for. Treating the plant's leaves with correct nutrients is only a temporary quick fix. Checking the soil's pH balance and adding the appropriate nutrients to the soil is the best way to a healthier plant. Proper pH levels for gardenias are between 5.0 and 6.5. If the pH balance is off, the plant cannot absorb the other needed minerals. Iron, nitrogen, magnesium and zinc can cause chlorosis (yellowing of the leaves) in the plant. Putting the nutrients in the soil is best so they can be absorbed by the roots rather than the leaves. If the pot is big enough, put the nutrients in the soil 1 foot or more away from the plant. Leaves also turn yellow due to too much fertilizer. Over-fertilizing will burn the plant and, in addition to causing yellow leaves, can cause irreversible damage to the root system. When using a fertilizer, use one that is designed for flowering plants and always follow the manufacturer’s directions.